Successfully Added USB Keylogger (Plug-and-Play) to your Shopping Cart. Secretly records everything that’s typed on your computer’s keyboard. No setup or software required and records chat conversations, instant messages, passwords and more! Just plug the K148 keylogger to any USB port and plug your keyboard into the back of the keylogger. The device will now start recording to the internal memory where you can store over 50,000 pages of text! To play back the text simply type in your secret password and the device will display as an external drive where you will view all your recorded text, organized neatly by date and time! Completely undetectable by security or anti-virus software, easy to install, and best of all- AFFORDABLE! You’ll find the same model selling for close to 3 times the price on other major electronics websites. 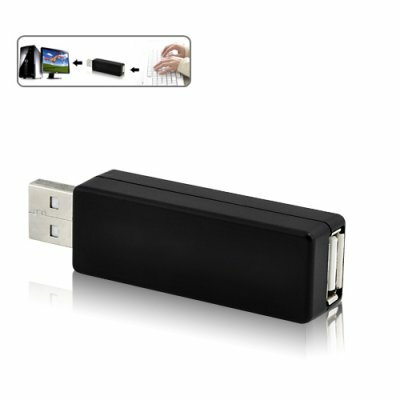 We sourced the K148 USB keylogger direct from the manufacturer and pass that savings on to you. Order now while supplies last and we’ll discreetly ship your new keylogger to any doorstep worldwide. I plug this USB keylogger in normally, but it doesn't seem to be working/powered on? Try using higher voltage USB ports, i.e. a self-powered USB hub or the rear ports of a computer (since the front ports are typically lower powered).